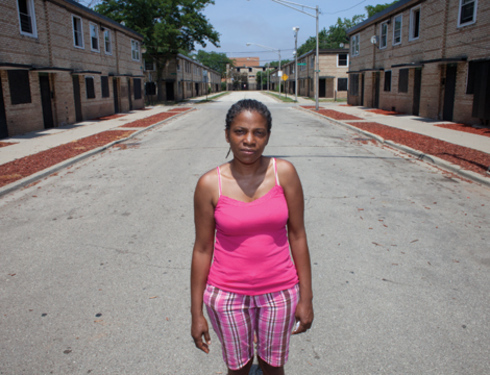 Gloria Franklin, a 20-year resident of public housing, was faced with the possibility of separating her family because of the Chicago Housing Authority’s one-strike policy. Photo by Jason Reblando. Gloria Franklin never imagined her son’s arrest would put her in danger of losing her home and cost him the right to live under her roof. But that was the consequence when her 17-year-old son Tyran Pratt was arrested allegedly with $10 worth of marijuana outside Franklin’s home in the Cabrini-Green community. Following Pratt’s arrest, Franklin received a letter from the Chicago Housing Authority informing her that she was going to be evicted. But under the CHA’s official occupancy policy, tenants such as Franklin can be evicted from public housing if anyone on their lease is charged with a criminal infraction. 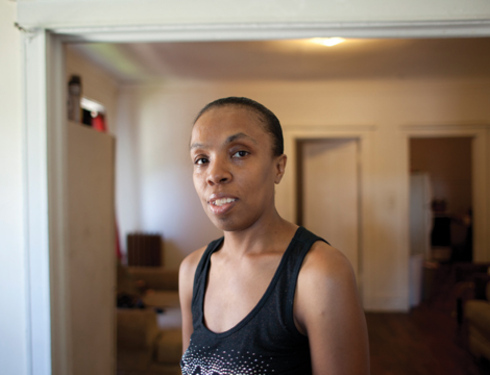 A 20-year resident of public housing, Franklin has lived in a row house on North Cleveland Street for six years—a relic of the Cabrini-Green public housing development that was mostly demolished by 2011. Franklin’s row house stands out from the rest on her block. Where her front lawn is adorned with flowers and a small garden, the other properties are covered with boards. Nevertheless, Franklin said it was a good place to raise Pratt, who was in high school when he was arrested in October 2009. She had also been sharing the house on Cleveland with her disabled sister; daughter, 29; and grandson. Franklin describes Pratt as a good child who tried his best in school. In addition to his regular classes at Roberto Clemente Community Academy, he met with an after-school mentor. Franklin said that although she knew Pratt smoked marijuana, she never allowed him to smoke around her or anywhere in her house. On Oct. 3, 2009, Pratt was arrested on the street outside Franklin’s house allegedly with a plastic bag containing one gram—or roughly $10 worth—of marijuana, according to a police report. Pratt’s arrest came at a high point for marijuana arrests that triggered one-strike cases in the Cabrini development, a Chicago Reporter investigation found. In 2009, 33 people were arrested for marijuana possession, by far the highest of any housing development and more than twice as many than the previous year. Of the 33 arrested, six of them, like Pratt, were 17-year-olds, the single-largest age group of arrestees. Pratt was booked and released on his own recognizance, according to the police report. Franklin was at work during the incident. Although Franklin said she was upset with her son, she couldn’t believe what happened next. “The plaintiff … has filed a complaint in this court to have you evicted,” read the letter sent to Franklin on Dec. 10, 2009. “I’m like, ‘What the heck is this?’” Franklin said. In subsequent negotiations with the CHA, Franklin said she was told that in order to keep her home, she’d have to take her son off the lease, bar him from the property and accept a yearlong probation. From December 2009 through July 2010, Franklin consulted with lawyers. “I did not understand how … my son had to be taken off the lease and me put on probation for a year, and there was no case,” Franklin said. Ultimately, Pratt’s misdemeanor charge was thrown out in court. A Reporter investigation found that more than half of the arrests that triggered one-strike cases were thrown out in criminal court. Even though Pratt’s case fizzled, the CHA continued Franklin’s case in eviction court. There, a judge ruled that Franklin could keep her home, but she’d have to kick out her son, who was still a minor at the time. She was told to take him off the lease and that he would be permanently barred from any CHA property, even though she didn’t have anywhere for him to stay. On July 8, 2010, Pratt was permanently barred from the property and removed from the lease. Franklin got choked up recalling the moment she told her son. It was one of the most difficult points in her life, she said. “I gave him a hug, shared a few tears, and I just told him, ‘You have to go; I’m sorry,’” Franklin added. Since Pratt left last summer, Franklin said she hasn’t seen him much. He dropped out of school and has been living on the streets. For the most part, Franklin has no idea of her son’s whereabouts.